The Bold and the Beautiful (B&B) spoilers for the next two weeks tease that things will heat up on the CBS soap. During the February 4-8, Zoe Buckingham (Kiara Barnes) will be caught off guard by Dr. Reese Buckingham’s (Wayne Brady) abrupt departure. Instead of going with him, Zoe will decide to stay in Los Angeles and do some digging. She’ll believe she can find an explanation, even with Reese out of the picture. Florence “Flo” Fulton (Katrina Bowden) will get flustered when Zoe shows up at Reese’s apartment. They’ll face off over Zoe’s suspicions, but their next battle will be the one that truly sends Flo over the edge. Zoe will realize Steffy Forrester’s (Jacqueline MacInnes Wood) new baby somehow fits into this, so she’ll demand to know how. Other Bold and the Beautiful spoilers say Hope Spencer (Annika Noelle) will feel peace for the first time in a while. Her happiness over holding “Phoebe Forrester” (Rosalind Aune and Isabella de Armes) will be like nothing she’s ever experienced before. It’ll be a welcome relief after all the grief Hope’s been dealing with. Later, Hope will keep that wonderful mental image of sweet “Phoebe.” She’ll remember how incredible it was to hold her, so she’ll plead for another baby bonding session. Hope won’t care if it’s weird or too much to ask from Steffy right now. She’ll be too obsessed with this kid to pay attention to much else. Liam Spencer (Scott Clifton) will have to handle Hope’s strong emotions as best as he can. Over with Brooke Forrester (Katherine Kelly Lang), she’ll stop by to chat with Steffy. Brooke will bring up Dr. Taylor Hayes’ (Hunter Tylo) colleague and wonder how this birth mother entered the picture. None of this will really add up for Brooke, but Steffy will insist that this adoption was on the up and up. Of course, Ridge Forrester (Thorsten Kaye) won’t feel the same way as Steffy. He won’t begrudge her the bliss she’s feeling, but he’ll want to look at the facts here. Ridge will think Taylor and Steffy may have been duped somehow, so he’ll grill them until they get frustrated. They just won’t see what the big deal is. The Bold and the Beautiful spoilers say Wyatt Spencer (Darin Brooks) and Sally Spectra (Courtney Hope) will have a more pleasant visit to Steffy’s home. They’ll marvel over the new baby and how much she looks like her big sister, Kelly Spencer (Zoe Pennington and Chloe Teperman). Naturally, Sally and Wyatt may feel silly for even suggesting it. “Phoebe” isn’t Steffy’s biological child, so they may think it’s all in their heads – at least at first. However, Kelly and “Phoebe” resemble their mutual dad. B&B fans will be eager to see someone start putting some of these clues together. During the week of February 11-15, Zoe will mull over whatever she’s able to pry out of Flo. Perhaps Flo will admit that this adoption isn’t legal, but that won’t be enough for Zoe. She’ll sense that there’s a specific twist that makes this truly terrible. It probably won’t be long until Zoe realizes Steffy has adopted Hope and Liam’s presumed dead daughter, Beth Spencer. Zoe will have a real mess on her hands as she deals with all this drama. Over with Hope, she’ll continue to have “Phoebe” on her mind and in her heart. Hope may cause some issues with her excessive need to be around this little girl. 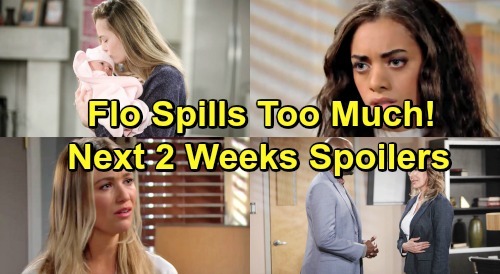 The Bold and the Beautiful spoilers say some great episodes are coming up. We’ll give you updates as other news emerges. Stay tuned to B&B and don’t forget to check CDL often for the latest Bold and the Beautiful spoilers, updates, and news.